YouTube has been spending big to promote its vMVPD service. 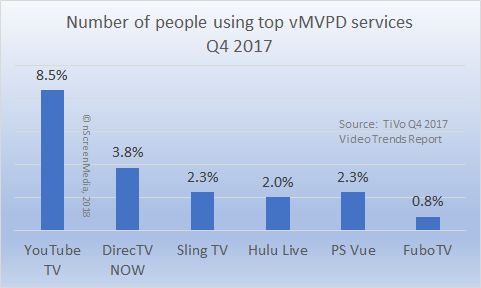 According to the latest data from TiVo, the service was used by 9% of consumers in Q4 2017. That would make it more than twice as big as its biggest rival. YouTube TV has been on an ad blitz for the last several months. The service was a very visible sponsor of Baseball’s World Series, spent big on other TV ad campaigns, and is doing more of the same this year. 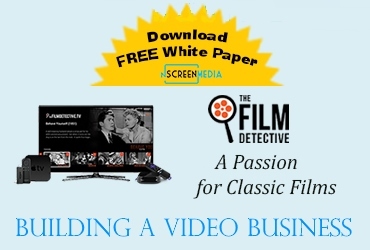 It is also advertising extensively to regular YouTube users. According to TiVo’s new Q4 2017 Video Trends Report data, the marketing spending is paying off. 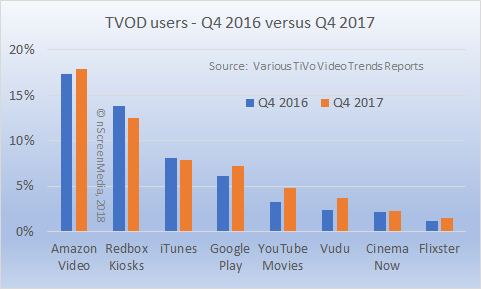 TiVo added YouTube TV to the quarterly survey for the first time in Q4 2017. An amazing 9% say they use the service. The next nearest service, DirectTV Now, has less than half of YouTube TV’s total, and Sling TV has less than a third. We should perhaps treat the YouTube TV number cautiously. It is possible some survey respondents confused YouTube TV with YouTube on TV. That said, even if YouTube TV has just half the number of users as TiVo indicates, it is still the new category leader. The TiVo numbers suggest the size of the vMVPD market could be much larger than the 4.5 million estimated. Dish Network reports that Sling TV has 2.2 million subscribers. YouTube TV could already have more than 4 million subscribers, and it could also mean the total number of vMVPD subscribers is almost double the previous estimates. TiVo’s data says that SVOD continues to grow in all dimensions. 68% say they use an SVOD service, up more than 4% over the previous year. Netflix continues to dominate, with 55% saying they use the service. 26% use Amazon Prime Video, 17% use Hulu, and 6% use HBO NOW. Spending on SVOD services increased strongly. The number of people spending more than $15 a month increased from 27% in Q4 2016 to 35% one year later. However, it could be vMVPDs that are driving this number, rather than people subscribing to multiple SVOD services. Only one vMVPD, Sling TV, has a tier below $21 a month. The rest charge $35 or more per month. The increase in the number of people spending over $21 a month was 9%, with 7% paying over $30. Time spent with the services also increased. 93% of people that subscribe to SVOD services say they use the service every day, 3% higher than two years ago. As well, the number of people that say they use their service for less than 1 hour a month decreased 10%, to 12%. Meanwhile, those using their service for 2 hours a day or more increased dramatically. 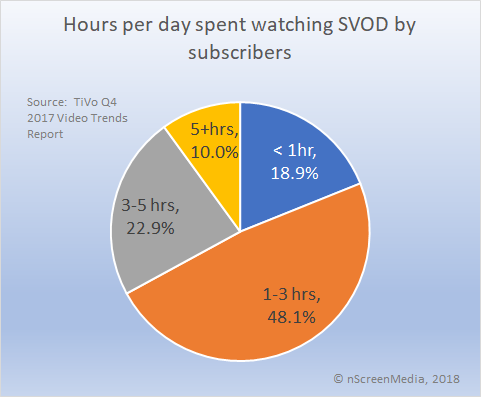 A third say they watch their SVOD services for more than 3 hours a day, and almost a half watch from 1 to 3 hours per day. Transactional VOD continues to struggle in the digital era. The number of people saying they had rented or purchased a movie or show online declined slightly over the last year, to 37%. Amazon maintained and slightly extended its lead, with 18% saying they used Amazon’s video store in Q4 2017. Redbox kiosk users fell slightly to 13%. Apple also lost a little ground to Amazon, with only 8% of saying they used iTunes in Q4. Google Play looks as though it may overhaul iTunes this year. It gained slightly more users and is only a little behind iTunes. These results are in line with revenue reported by the Digital Entertainment Group. It reported that electronic rental revenue fell 17% in 2017. DEG also reported that digital movie sales were flat for the year. Smart speakers did very well during the holiday season. The number of people reporting they own an Amazon Echo or Google Home increased 7%, to 22%, over the previous quarter. Amazon Echo devices maintain a big lead of Google Home. 38% of smart speaker owners say they have an Amazon Echo and 19% have an Amazon Dot. 36% say they have a Google Home. The most popular tasks people use their smart speaker for are to play music (75%), general knowledge and trivia (50%), and timers (40%.) Streaming and playing video content on TV via a smart speaker is only the fourth most popular task on the devices (38%). However, it is getting more popular, with 4% more people using the devices to control their television in Q4 than in Q3. vMVPDs are becoming more popular, as exemplified by YouTube TVs strong 2017 growth. SVOD continues to grow users, and those users are watching and spending more on the services. TVOD continues to struggle I the digital era, though Amazon completely dominates the market. Many people purchased home smart speakers in Q4 2017, and many people are using them to control their TV experience.